Most people read me as fairly non-emotional at 1st interaction. I'm not super social, but consider myself to be friendly. It is certainly rare that I get emotional in front of others. I want to say it is because I have spent the last 8 years as a CEO that has to pull it together and put on a brave face while we conquer goals bigger than ourselves. In an honest retrospect, I guess I've really always been this way, just mostly even keel, and ready for a challenge. When my closest friend heard that I started RuffleButts, her response was "of course you did." At the time, her response caught me a little off guard, but after a short explanation, I knew exactly what she meant. In a way, my life path prepared and led me right to this journey. In a way, I always knew what I wanted to do, without having any idea what that was...if that makes any sense to anyone! Anyhow, there are many things about this journey that I completely expected and many more that I did not. One of the things I didn't really see coming was how much I would be impacted by those that signed up to walk along side me in this RuffleButt journey. They affect and impact me more than I ever knew possible. Back to my non-emotional statement earlier, while I may come across fairly non-emotional, I am actually affected quite deeply by those closest to me. As an only child, I don't have a large family, so in a lot of ways, this company has become my family. They are certainly the people that I spend the vast majority of my time with. Today, these people truly made my day! I had no idea it was bosses day and quite frankly, what is "bosses day" anyway?! While I may technically fall under that definition in some ways, I don't ever considerate it my title in any way. While I may come across as bossy...let me try that again...while I do come across as bossy in many ways, I never think of myself as "the boss". I mostly think of myself as the captain, but a ship without mates would certainly not be a successful one. I carry the responsibility of captain quite seriously, considering that more than 25 people have trusted me enough to put their career in my hands. And, it goes without saying, that I absolutely could not do it without my co-captain (and hubby). So, this morning our team told me that something was serious and we were needed in the conference room. When we arrived, this incredibly creative creation awaited on the table. As I looked up, our team joined us in the conference room to celebrate "bosses day". I was not only touched by the kind words, but also by the obvious effort that went into such a gift. 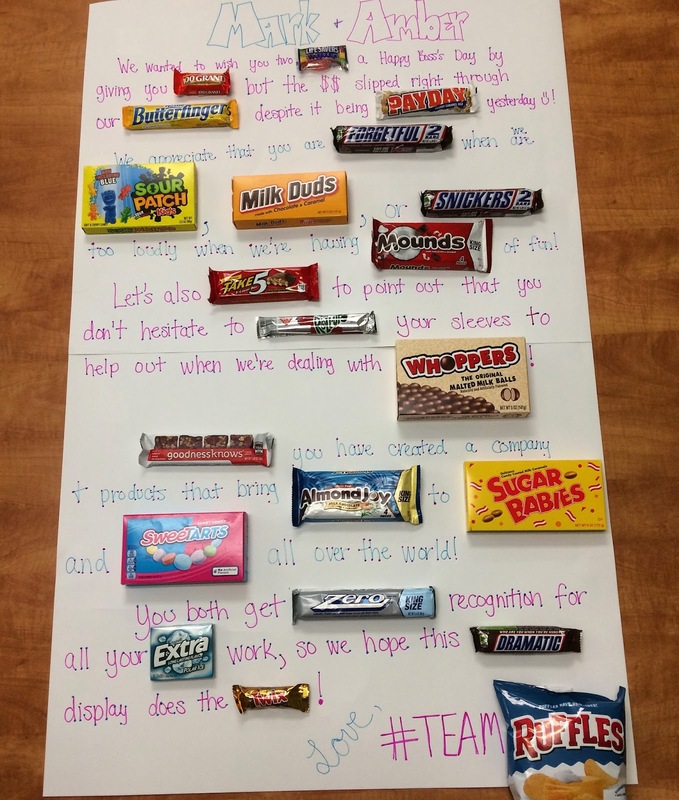 I have to say I have never seen anything like this candy bar poster before, but what a great idea!! To my team, THANK YOU!! Thank you for making this dream possible. Thank you for your loyalty to our vision. Thank you for your commitment to helping make it happen. Thank you for your forgiveness that I am far from perfect. Thank you for your understanding when we make mistakes. Thank you for your determination when our goals seem out of reach. Thank you for making us laugh with your clever slack commentaries. Thank you for the in-office entertainment. Thank you for your positive attitudes. Thank you for your lack of drama (seriously, this is a big one!). Thank you for all that you do!